Don’t stir rice again and again during the foil process. Cover it and cook for 8-10 minutes on low flame. You can adjust the chillies & salt according to your taste. Take a blender and add Mint, coriander, grated Coconut, green chillies and make a smooth paste with the help of few drops of water. Now take hot oil in a kadaai and whole spices and saute for 2 minutes. Now add Garlic Cloves (not chopped) and fry till the garlic change into golden colour. Add Paneer, cashew and fry for 2 minutes and take out in a plate. Now add Chopped onion & veggies and fry for 5 minutes. Don’t cook too much only saute roughly , Otherwise vegetable’s colour will be changed. Now add green mint, Coriander paste & beaten yogurt and mix roughly. Cover it with a foil properly and carefully because kadaai will be very hot so be careful and place a lid on the foil. Cook the rice only for 8-10 minutes on low flame. 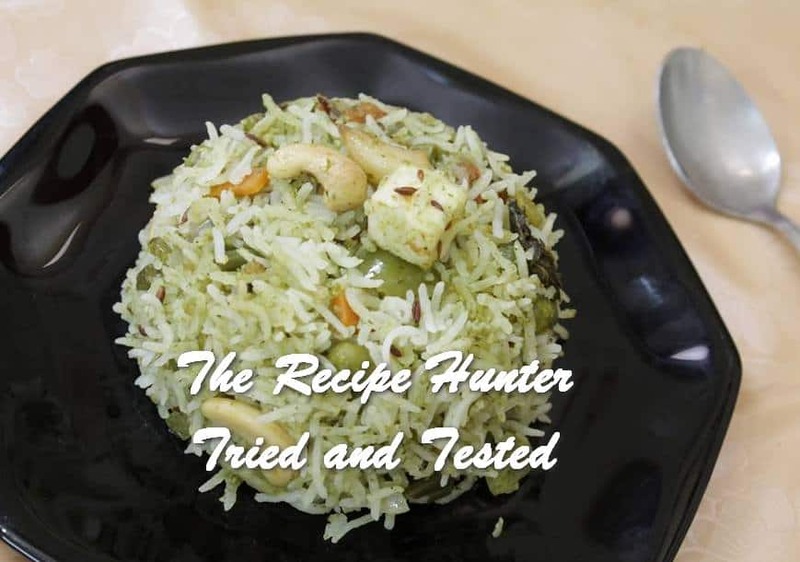 Burnt Garlic Creamy Mint Rice is ready to serve. Serve with yogurt or any type of Raita & You can eat also without yogurt.